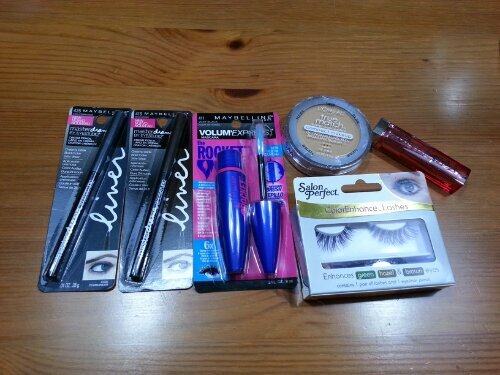 Picked these up recently and they are all re-fills EXCEPT for the salon perfect lashes and lipstick. The eyeliners & mascara & powder are my makeup bag staples. LOVE the products, the colors and the way it wears all day. Color Whisperer lipstick is my faaaaave right now. These lipsticks go on as smooth as lip butters (which i love). These don’t last very long so you have to keep reapplying throughout the day, but I love the color, amount of pigment it leaves, and the feel of them on my lips! Anyway~~ I did some shading, highlighting…and used a VERY heavy hand =P I also curled my hair, which is a TOTAL rarity these days! Here’s my fake eyelash trick below! I always wear TWO strips (different kinds) on each eye. It makes my lashes look fuller and my very small eyes bigger. I am fairly obsessed with makeup. I’ve gone through eye shadow phases, lipstick phases and blush phases. Now in my late 20s, I’ve finally figured out a makeup regime that works for me. After watching a million youtube videos and seeing hundreds of girls applying makeup~ I find that no matter what~ I still have my own preferences and style. One that probably doesn’t work for other girls, but what works for my face, my eye shape, and my comforts. I have a round face, so I prefer to use a heavier hand with bronzer, blush, highlighter. It helps me to shape my face to a round oval and give myself a jawline. Additionally, my monolids have a more slanted almond shape, so I am really particular about my eye makeup & eyebrow shape. Most girls use wingtip or accentuate the almond shape (like when I get my makeup done), but I try to make it a more rainbow shape. lol Does that make any sense? I’ve never thought to do this with eyeliner or shadow~ such a great way to make your eyes pop for spring/summer 2012!